AGMCA has had a long standing interest in Trades Training. The Association was the main catalyst of Ontario’s Glazing & Metal Mechanic Apprenticeship Program which, began in the early 70’s.AGMCA believes that, Apprenticeship and Journeyperson training is a key to the ongoing development and maintenance of a healthy Industry. AGMCA plays a major role and participates with Government and Labour in overseeing and monitoring Provincial training initiatives, to ensure the system is not compromised. The Architectural Glass & Metal Technician and Metal Mechanic Apprenticeship Program was developed to provide trades people with theoretical knowledge of innovative techniques and procedures associated with the assembly and installation of glazing systems. The curriculum centres around a 8,000 hour/ five (5) year program which, includes three (3) – eight (8) week In-School sessions (Basic, Intermediate & Advanced). In Ontario, Trades Training is financially supported by Employers, Government and by the Apprentice. 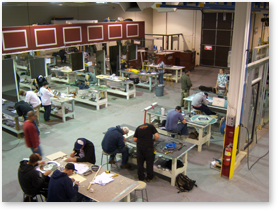 Currently, Architectural Glass & Metal Technician & Metal Mechanic Training Programs are offered at the State of the Art, Ontario Industrial and Finishing Skills Centre in Toronto and satellite Training Centres in Nepean/Ottawa and Ancaster/Hamilton areas.